On the edge of Williamsburg a couple weeks ago I walked over to do a visit with artist Matt Jones in a building I had yet to explore. I was greeted with a firm and friendly handshake at the front of the building by one of Matt's studio assistants, Josh Freydkis, early that morning. After winding our way past what seemed to be a fashion shoot in the works, we got to the entrance of Jones' space. It was packed floor to ceiling: scattered with primed and ready canvases, bicycle chains, light tables, a batman figurine, and remnants of his earlier works and installations. I was then introduced to Jones' other lovely assistant Emily Means. Instantly digging the jovial and animated vibe this trio was giving off, I knew it was going to be a lively day of drawing and making. 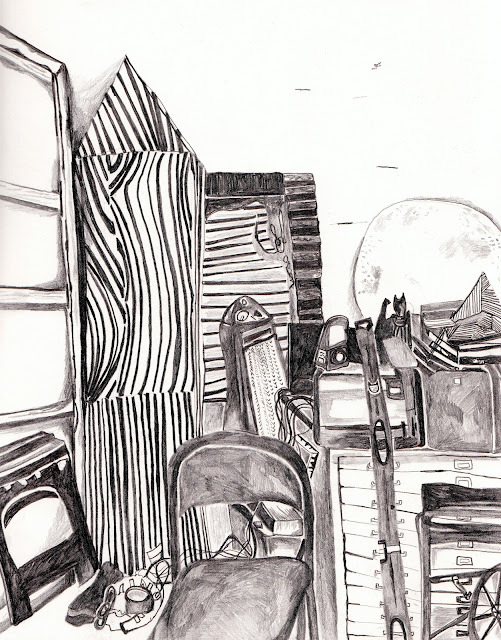 Finding a spot in the corner, I watched their studio day unfold. The first step was to send Josh out for some more paint and of course, more coffee. As they talked over what colors to buy I couldn't help but chime in, remembering fondly my own days of being a studio assistant. 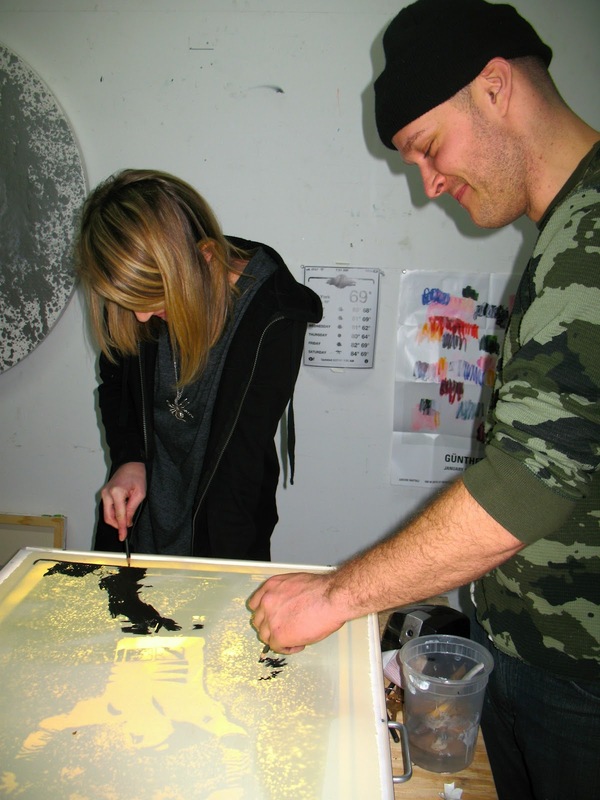 There are many different types of work under the umbrella of artist Matt Jones. The day I was there Jones was preparing to work on a group of paintings he will soon recreate abroad for a two person show with Kadar Brock at Horton Gallery in Berlin that will open February 25th. 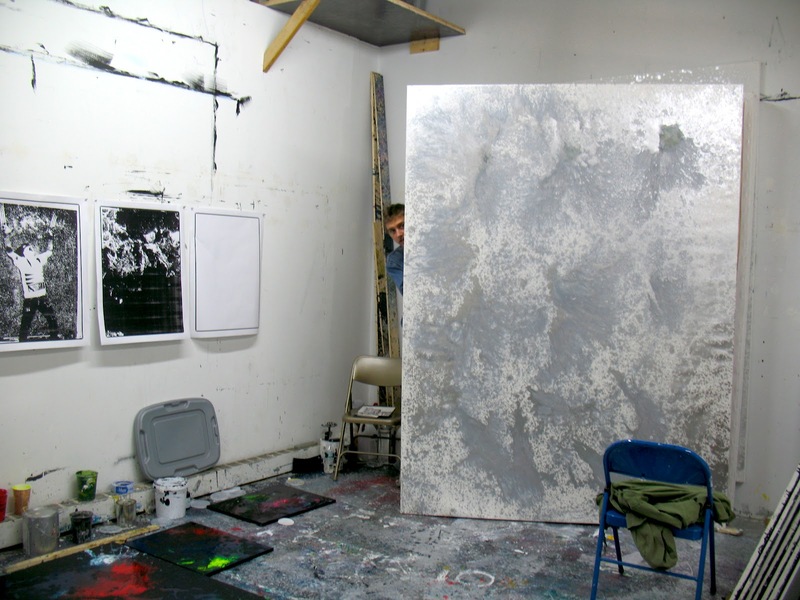 He met Kadar in 1998 where they shared a studio wall between them in their senior year at Cooper Union. Jones explained that he likes to make the work for an exhibition while in the place where the exhibition will be. Given that he calls this particular group his "Energy Paintings," this seemed more than appropriate. Conjuring up a form of this physical energy (be it cosmic, supernatural, or just plain kinetic) in this super-real step of pre-installation gives the work a particular kind dynamism. It is as though a surging force is carried from Jones' studio in NYC to its new home on the canvas in the gallery abroad -- like a magic trick. 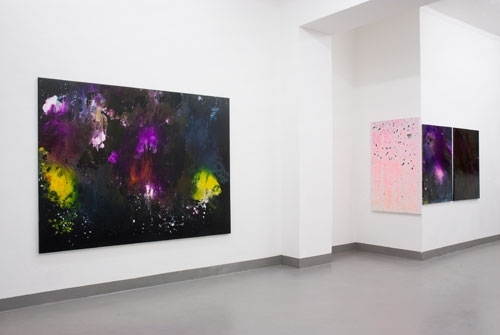 I saw the show he was in last month at The HOLE and could totally feel the sublime energy that the paintings give off: in the dizzying motion of the mark, the slippery glossiness of the surface, and their garish aurora borealis-like colors. By getting to know Jones' spirit as well as his work during my time in his studio, it was clear that his intensity of humor and outlandish behavior carry through into the work as well. 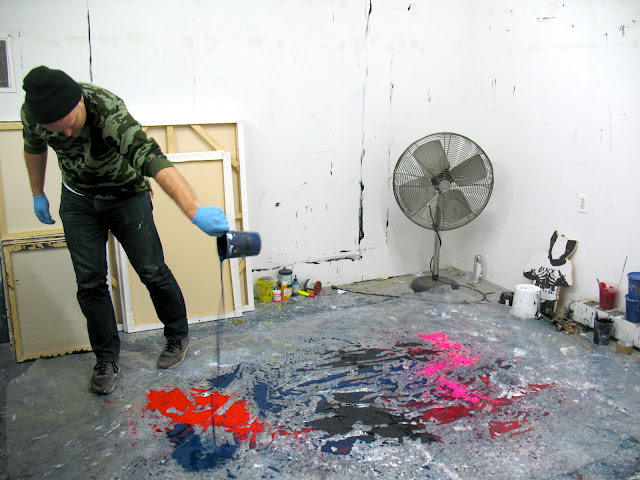 Once Josh returned with the paint, Jones and his crew mixed up several containers of color before Jones began to pour the paint down on a large sheet of plastic. He danced around the plastic, gesturing above it slowly in order to be specific in each color's placement. There is a real fine art to pouring and Jones has a certain finesse for it. As his assistants and I watched on, he kept up his comedic banter, entertaining us all while he worked. Once he finished this step he began to put the canvases (prepped with black gesso) face down on the paint. He then stepped on the back of the canvas to insure that the paint would take to the surface, leaving behind colorful ghost-like sneaker marks on its underbelly. With each one, he used a different flick of the wrist to raise the piece off the plastic, leaving each canvas with a distinct personality. Later, once they have dried, he will coat them with a water based polyurethane, slicking them up in their final steps of completion. Another group of work that Jones makes is based in photography. He takes photos of himself as a character or personality. These personas sometimes arrive in costume, giving melodramatic stances, or making freakishly outrageous expressions. Jones then reduces them to a black and white photocopy in order to continue their transformation. He might then blow them up very large to make cutouts of the figure, later placing them in the center of a gallery. 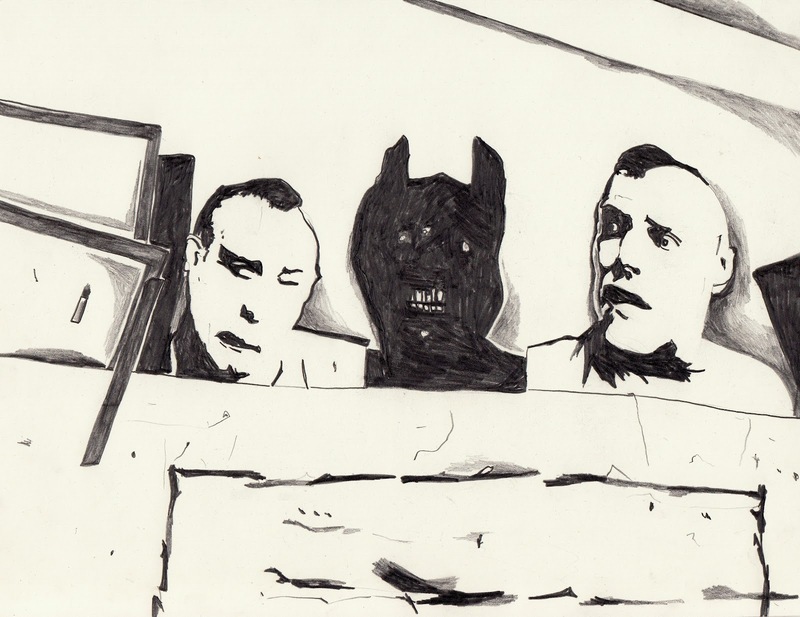 He also lays them out on a light box with a piece of paper on top in order to directly recreate them as ebony pencil drawing soaked with paint thinner. 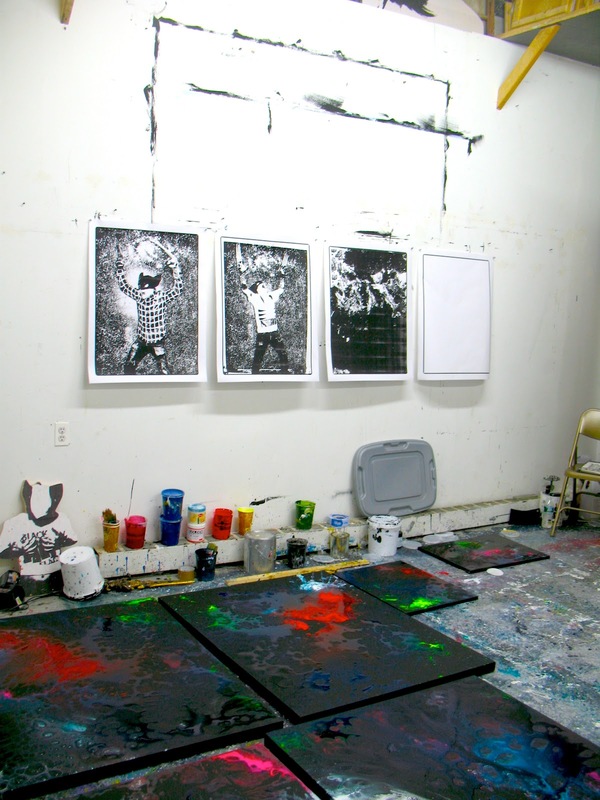 Jones' work seems to relate to mass production, both in its execution and its reference to the zines and music flyers of our younger years, so heavily coated with inkjet black. Above all, laced with humor and horror, this body of work has a really active and improvisational presence, as though each piece is a personality in the fantasy world that is Matt Jones' art. Matt and Studio assistant Emily at work. This is another body of work Jones' took out for me and one of his many visitors that day to look at. With all the energy that was swirling around in the studio I ended up heading out before the rest were ready. I was totally spent, jaw hurting from laughter. I was told they were missing a crucial member that day, main assistant Eric Wiley. This dude's ears were surely burning, they talked about him quite a bit. Jones ordered a pizza at studio half time and we all sat down to watch an episode of Walking Dead. They caught me up on what was going on, jokes flying of course. I had a real blast with them that day, even as an onlooker. Check out more of Jones' rad work at http://mjones.info/.